Hire Wedding Magicians in London, United Kingdom - No Agency Fees! If you are looking to hire a London Wedding Magician, you've come to the right place! London is an amazing city at the best of times, but there is a palpable sense of optimism when a couple decides to choose to tie the knot in the capital - what a great location to be setting off on your own life adventure! Find out how booking a london magician can make the celebrations even more memorable. Want To Receive A Range of Quotes From Available Wedding Magicians? You'll know that organising such a special event will take your planning skills to a new level - and it can be so satisfying to know that your budget will meet your entertainment expectations. With all those options to choose from, what's going to give everyone a great time? Easy - hit the Guaranteed Fun Button during drinks, between courses or before the speeches by hiring your very own Magician! They provide the ideal fun fuelled entertainment that will have everyone smiling - what better way to shift the pace from formal to fabulous? A Magician adds a large dose of extra added value to your wedding party. 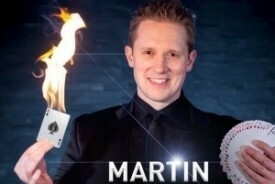 If you've not witnessed a Magician in action before, you are in for a real treat. They mingle and engage with your guests or visit individual tables - the choice is yours. They are highly adept at performing sleight of hand tricks, together with close up magic - which defies explanation, mind reading and more. As an adult, this sort of fun is not so readily available, and people love the fact that they often cannot explain away the tricks that are performed right in front of their eyes! It creates a real sense of wonder and is an ideal form of light entertainment to get everyone chatting and relaxing. They don't hurry their performance - it's all very low key, but work the room in such a way that everyone has chance to witness their skills during their time at your event. Sets last for about 30-45 minutes. Your chosen entertainers can take a break and return for a further set. 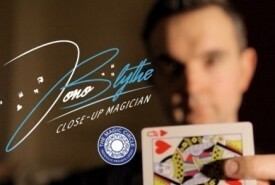 They are used to working in complex spaces and, with their incredible memory skills, will know who has yet to experience some close-up magic. Magicians tend to have terrific personal skills too, so anyone who eschews the lime-light will be able to enjoy the show from the sidelines. 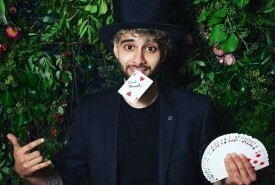 Booking a magician offers a perfect entertainment choice for a wedding - they are undemanding, polite, engaging - so add a touch of brilliance to your next event with a touch of Magic! If you are thinking about what route to go for entertainment, why not get a flavour of London's colourful past, with a Guided Walking Tour - Meandering Magic led by professional magicain James Pritchard who is based in London and takes in the capitals key magical history venues? Take a close up look at Harry Houdini's straight-jacket for instance in the entrance doorway of the Hippodrome in Leicester Square and check out venues where the eerie Ghoul Trick was performed to astonished audiences. Take in the Magic Shop near Trafalgar Square and see what magical tricks you can buy to try out yourself or gaze at the old Theatre Programmes and Posters of the the Victorian era, when Magic was a regular feature at the Variety Theatres in the Capital. Your guide, incidentally, is usually also a first class Magician, beguiling and bewitching you with tricks along a the way! It's a great way to spend an afternoon on a bright Spring day. And for a fun fact - we've all heard of the phrase "spend a penny" - but it's rather a surprise to know that it was coined by John Nevil Maskelyne a Victorian Magician with a gift for invention. Maskelyne devised the wonderful Pay Toilet! He ran the renowned Hippodrome Theatre in London's West End, where Harry Houdini frequently appeared and made a mint through magic performance and the sheer brilliance of charging people to visit his pristine bathrooms! It's a magic idea from the past that has really stuck! London is also the home of the Magic Circle Club - take a look at this article on our blog about visiting the Magic Circle and maybe making a booking to be in the audience at one of their special shows. "Martin arrived on the dot and his communication before the event was excellent. 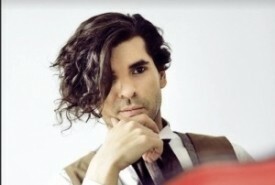 He amazed us all with his Close-up Magic tricks and his stage show had our audience in stitches!"